Talking about ‘health’, the first impression that people will come up with is usually only about food-intake and physical exercise. While this is right, ‘health’ covers more than just food and exercise. “Am I emotionally well and relaxed?” - This is the question that we should constantly ask ourselves. In today’s world, most of us live in a “go-go-go” environment where there is always something to do and never enough hours in the day. Living an emotionally healthy lifestyle becomes a real challenge for us. Stress is a just one of the common outcomes of such a busy lifestyle. What is stress? Stress is the emotional and physical strain caused by our response to pressure from the outside world. Some stress is normal and even useful – it can stimulate us to work hard or react quickly; but if stress exceeds the limit that your body can cope with, then it becomes harmful to your body. Common physical symptoms from stress include sleeping disorders, muscle tension, headache, gastrointestinal disturbances and fatigue. There are several ways that we can try to lead a life balancing stress and relaxation. Set realistic goals or break down a big goal into easily achievable tasks. The more detailed tasks we break down from a goal, the more confidence we get to achieve them. And always plan ahead and give some room for unexpected changes. Identify what’s important and what’s urgent. Not all urgent projects are important. Our first priority will always be the most important and the most urgent project. It is vital for us to distinguish between ‘Important’ and ‘Urgent’. Put things into perspective and try not to get upset about insignificant or relatively unimportant matters. Maintain a positive attitude. Thirty seconds is enough time to shift your heart’s rhythm from a state of stress to relaxation. Creating a positive emotional attitude by conjuring up a positive thought, can also calm and steady your heart rhythm, contributing to feelings of relaxation and peace. The easiest way is to breathe deeply. Feeling stressed evokes tense, shallow breathing, while calm is associated with relaxed breathing. So turn tension into relaxation by changing the way you breathe. Also, as we all know, participation in regular physical exercise is going to help. Taking up a favourite sport or regular everyday exercise will go a long way in helping you relax. Social Interaction. Social interaction induces relaxation. Experts say social interaction helps your brain think better, encouraging you to see new solutions to situations that once seemed impossible. Studies on social interaction have shown that simple gestures such as cuddling your child, petting your dog or cat, may actually help lower blood pressure and decrease stress hormones. Snack on Healthy Foods. The idea of relaxation for most people is sitting on a cozy couch in front of the television with a bowl of deep-fried hot chips! This is definitely not a healthy way to relax. Pick an outdoor spot where you can get fresh air, and choose a healthy snack that has calming properties, such as a bowl of wholegrain cereal, a fruit rich in Vitamin C, and a quarter of a cup of almonds or pistachios! 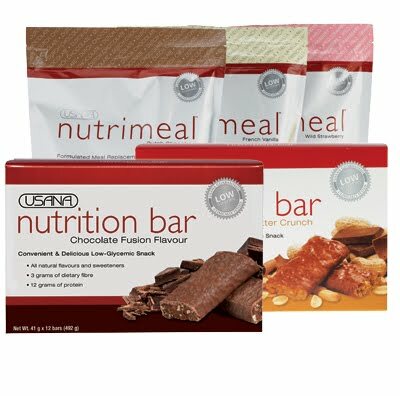 USANA offers cool healthy snacks: Nutrimeal Shakes and Nutrition Bars. To check out further information, please go to the USANA Foods centre. As Abraham Lincoln said, “Most people are just about as happy as they make up their minds to be.” So make up your mind to indulge in healthy relaxation and enjoy the results. Here’s wishing you all a healthy start in 2011!